Whether it's Split's sun-kissed spot on the Adriatic Sea, or the UNESCO World Heritage listed Old Town, it's not hard to see why Split is one of Croatia's most popular tourist attractions. The city's most iconic attraction is Diocletian's Palace, which was built around the turn of the 4th century by the Roman emperor, Diocletian (which he built in preparation for his retirement). During the 20th century, Split grew in prominence, especially as Yugoslavia's major seaport. When Croatia declared its independence of Yugoslavia in 1991, Split became the site of occasional violence. Today, however, it is a peaceful and remarkable city, where the natural beauty of the Adriatic Sea is complemented by the historic architecture of Old Town. Marjan hill - Beautiful Marjan hill is also known as lungs of the town. You can enjoy nature and the best view of old town and islands. Bacvice sandy beach - Split is the town of many beaches but the Bacvice sandy beach is most famous. There are many caffe bars, restaurants and nightclubs in the area. ''Picigin'', which is a famous water recreation sport originating from Split, is often played on this beach (even during winter monthes). Peristil - Roman square in front of Saint Duje cathedral - one of the main tourist sights in town and a stage for many cultural events (Split summer games and similar). Vestibul - Rectangular on the outside and oval on the inside, Vestibul is an ancient imperial antechamber preserved in appearance to the present day. The Old Town with Diocletian's Palace is on the Unesco World Heritage List and makes for a great half day to wander around and enjoy a gelato or coffee at one of many places available. March in Split sees the arrival of the beautiful people and their equally beautiful yachts for a week of racing along Croatia’s southern coast. People-watching and celebrity-spotting are favorites at this time. The Split Summer Festival is an open-air feast of plays, concerts, operas, and ballet performances taking place July and August in Diocletian’s Palace, the Basement Halls and many other venues. Outdoor stages are set up for international and Croatian artists and musicians, and the festival attracts a large number of overseas visitors. Split has a Mediterranean climate with warm, sunny and dry summers and mild but wet winters. Temperatures are usually around 28 °C to 32 °C during the summer months of June to September and 10-14 °C during winter (December - February). Nights average around 20 °C during summer and are still well above zero during winter. Most rain (snow is rare) falls during the winter months. Split Airport (SPU) offers a range of flights. Croatia Airlines flies to/from Amsterdam, Belfast, Berlin, Brussels, Dubrovnik, Düsseldorf, Frankfurt, London, Lyon, Munich, Paris, Rome, Vienna, Zagreb and Zürich. Several lowcost airlines serve the city as well, with destinations including Bristol, Geneva, London and Milan with Easyjet and many other airlines serve cities like Copenhagen, Vienna, Helsinki, Oslo, Stockholm, Moscow, Prague and Luxembourg. There are no direct international connections, but there are several daily trains to Zagreb (5.5 hours overnight trains take 8.5 hours), Zadar (3.5 hours) and Šibenik (1.5 hours). Split is connected with Zagreb and the rest of the Central Europe via A1 highway. There is also a famous Adriatic route from Rijeka to Dubrovnik (including Split) with best views on Adriatic coast. Buses connect Split to almost all major cities and towns in Croatia, including Zagreb, Rijeka (8 hours), Zadar (3 hours), Dubrovnik (4.5 hours) and Pula (10 hours). There are also many international connections, like the ones to Basel, Berlin, Belgrade, Ljubljana, Trieste, Sarajevo and Mostar. To Mostar there are about 7 daily buses, Sarajevo has 4 buses a day, and Belgrade and Ljubljana daily. Further away, buses usually go once or several times a week. Jadrolinija between Split and Ancona. From Pescara, crossings by ferry arrive in Split, but only during the summer months of June to September. Check Jadrolinija or SNAV for details. Jadrolinija is the main ferry company with connections between its many islands and coastal towns. Split tours is the main operator for the area around Split (Hvar and Vis), but of course Jadrolinija has domestic connections from Split as well. For a full overview check this ferries website. For all other domestic connections from Split visit Adrialines for full timetables. There are several useful bus lines available within Split including the one to the Roman ruins north of the city and the bus to Trogir, about 45 minutes away, which also travels via the airport. It is a little known fact that there is a local suburban railway service between Split and Kaštel Stari at the shore of Kaštelanski Zaljev (Kastelanski bay). Although Split is a large city, the places of interest for travellers are in the central core area, including the Old Town and the places adjacent to the Old Town, like the harbour, boulevard and Marjan Hill. There aren't many bycile paths in the town but it is possible to reach all the sights with bike. Rent a bike and enjoy beautiful biking along Split's waterfront (Riva), continue to Marjan hill (approximately 7 km), climb to the top of the hill for great view on the Split town and surrounding islands. You can bike to the east side, along the coast to nearby village of Stobrec. Another great option from Split is to take a day tour to nearby islands of Solta, Brac, Hvar or Vis. You can take the bike on a regular ferry (they leave approximately every couple of hours in the summer season) and bike along quite roads and charming villages, explore great beaches and restaurants and return in the evening to Split! Italian influences dominate on Croatia's coast, amongst the best are; Risotto with tender white scampi or black calamari, a dish beloved by all Croatians. A wide selection of salumi, magnificent Istrian and Dalmatian hams (Dalmatinski pršut - comparable to Parma or Speck) and cheese from the island of Pag, are well worth trying. Please note; in a world suffocating under the weight of processed foods, Croatia's coastal cuisine is unique in that most of its produce is organic. Do not miss Dalmatian pašticada s njokama (Gnocchi). Ćevapi or Ćevapčići (diminutive), are small grilled rolls of minced beef, pork, or lamb, or a combination of any of these three. Usually served with chopped onions, Kajmak (similar to clotted cream) or Ajvar (a relish made from bell peppers, aubergines, garlic and chilli). Ćevapi are traditional Bosnian dish and they are popular across the Balkans. Split's eateries are to be found in a variety of settings, ranging from the romantic to the vibrant. It isn’t difficult to enjoy superb food and wine in a classical environment with good friends and/or family. Plenty of fast food joints between the Old Town and the bus station. Konoba Marjan, Senjska, 1, ☎ +385 98 9346848. Risottos, pasticada (marinaded veal cooked in sauce), and excellent fish. Prices are very reasonable and the staff very friendly. English spoken. Kod Sfinge Vanevropske Zviri, Ulica Kraj Svetog Ivana 2 (Inside Diocletian's Palace, inbetween Jupiter's temple and Peristil), ☎ +385 99 443 8666. A Konoba/Trattoria. Good Dalmatian specialties: Pašticada, Paški sir, etc. Also proposes good seafood catch of the day, but sometimes unavailable. Seems to be operated by a single family: The waiters knows very well the menu! Pašticada for 150 kn. Buffet Picaferaj, Popovica 2. A small restaurant on a side street that serves fresh seafood dishes. Run by a young married couple. Pasta with fresh prawns and mussels is 70 kn. Na kantunu, Dominisova 9 (within the Diocletian palace). After 3 rounds waiter will bring traditional rakija with honey (medica)-nice and strong. 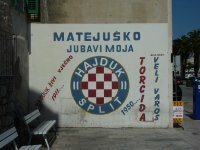 Supporters of Hajduk Split are there, so when there is a match in Split it may become too crowded. It is probable the smallest bar in Split with 8 tables inside in a 15 m² space. Great atmosphere and a cappuccino is 8 kn. In front of the cafe bar there are few tables where you can sit if the weather is nice. Karlovačko beer only 12 kn a pint, Velebitsko beer is 15 kn a pint. Guesthouse Split, Lovretska 1 (next to the archeological museum). Free WiFi, private rooms available dorm bed €13-18. We have a comprehensive list of accommodation in Split searchable right here on Travellerspoint. You can use our map to quickly compare budget, mid-range or top of the range accommodation in Split and areas nearby. This is version 56. Last edited at 16:32 on Dec 20, 18 by Utrecht. 49 articles link to this page.